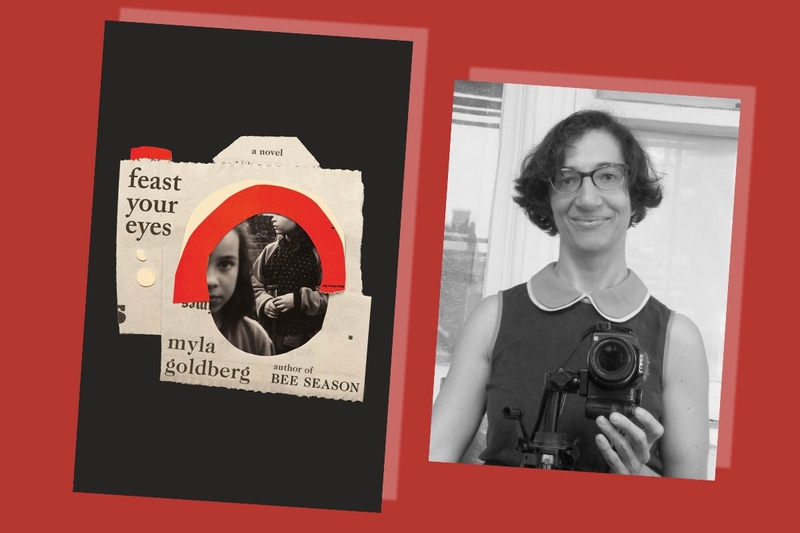 Author Myla Goldberg is back with Feast Your Eyes, a beautiful and compelling novel about a female photographer who grapples with being a mom and an artist. The novel is structured as catalogue notes from an exhibition at New York’s Museum of Modern Art. It’s a retrospective focused on Lillian, a street photographer; the 118 notes describe the photograph and are written from the perspective of her daughter, interwoven with oral histories from Lillian’s friends, lovers, and peers. Set in the 1950s through the early 1970s, Feast Your Eyes is, at its core, a story of mothers and daughters. In this fictional world, Lillian shot to infamy for an image of herself and her daughter, Samantha, after Lillian gets an illegal abortion. We won’t dive too much into the plot, because you should really read the book yourself. However, Goldberg’s frank address of abortion, particularly the challenges of abortions in pre-Roe v. Wade America, makes Feast Your Eyes feel particularly suited for our current moment. We spoke with Goldberg — who has two daughters, ages 15 and 11 — about writing about photography, illegal abortions, and the elusive search for a work-life balance. What inspired you to write about a street photographer? I lovingly call [the book] my “midlife crisis” novel. It started with [questions] I’ve been grappling with ever since I had children. My oldest is now 15, and ever since I started on the whole process of parenthood, I was always kind of grappling, as we all do, on how to balance the different things in our lives. My artistic ambitions and aspirations are demanding of a certain amount of time and attention — as are small mammals, who require care and feeding! So this book kind of started with just me asking the question, are there any examples of brilliant artists who are also brilliant parents? Can you be both? That was a starting point. The photographs you describe in the book feel so real. How did you conjure up those images? Were you looking at images? Yeah, I stole pretty much all of those. [Laughs] The great thing about working with images in words is you can take anything. Cause if I’m describing it, it’s not like I’m using the actual photo. What real-life photographers did you draw inspiration from for Lillian’s work? In the back of the book, in the acknowledgements, I give a gigantic list. So when I say “steal,” I wasn’t stealing as in anonymous theft. All art is about borrowing and making it your own. And so, I always think it’s really important to credit is where credit is due, and to just acknowledge everyone. The two biggies were Vivian Maier and Garry Winogrand. Running a close second would be Louis Faurer and Helen Levitt. And Sally Mann was massive, and Diane Arbus. How did your relationship with your daughters, and your career, influence Lillian’s story? Can a woman can be a brilliant mom and a brilliant artist? For me, coming into parenthood, I definitely felt a sense of competition between my time with my kids and my time with my work. And, so, there was a long state where I thought they were in conflict with one another. I don’t know if it was through the course of writing the book, or me continuing to grow and learn as a parent, [but] I realized that they actually exist in congress with one another. The parenting I was doing makes me a better human, and also a better artist. When you’re a better human, you’re a better artist. The photo that causes the most drama in the novel isn’t a “street” photograph but a self-portrait of Lillian just after she had an illegal abortion, and abortion drives much of the plot. What was your research process like learning about abortions in the pre-Roe v. Wade era? There’s a wonderful, horrible book called The Choices We Made, and that was basically the touchstone for my writing on abortions. It’s a collection of personal essays about women talking about their illegal abortions. And they’re all famous, and they’re not anonymous. They’re like: This is me, hi, this is my abortion. It drew a very clear line between being ambitious, being a woman, and having an abortion. It was kinda what you did, because it was the only way you made sure you didn’t have to give up anything in that era. It was so heartbreaking, but also inspiring. A lot of the information I drew, I drew from that book. So much of what you write about in Feast Your Eyes is historical, yet it feels so present and relevant. Exactly. I mean, this was a book that was 10 years in the making. This was a project started during the previous presidential administration, where it felt more abstract. [Laughs]. Now that it’s a different presidential administration, all of this stuff feels much more a clear and present danger situation, rather than just a historical look back on the way it used to be. I am very much pro-choice, however, it is not a simple decision. I wanted to present the personal struggle that goes with deciding whether or not to have an abortion; I wanted to portray that with all the complexity that attends each individual choice that is made on that issue. And, I wanted to address the fact that even if you are pro-choice, it doesn’t mean you’re happy with what you have to do. And that it’s a difficult feeling, decision, every single time. It’s never simple. We polarize [abortion] so much, and it’s so easy for each side to paint the other in the most simplistic black and white terms. Which does everybody a disservice. There’s a lot of complexity to pro-choice side of the thing, and there’s a lot of complexity to the anti-choice side. And I think that considering those complexities is what we need to do to get anywhere. It’s so important to talk about abortions and all their complexities, because the reality is, having an abortion is common. It is common! But we don’t know that, cause people don’t talk about it. And there’s a fear around talking about it. We live in such fearful times. More than ever, people are so afraid of being branded a certain way because of something that they say, so they hold back. If everyone felt more comfortable talking about their experiences with abortion, it would normalize it. Something normal that is difficult and painful, yes, but a reality in the lives of many, many people. Abortion isn’t this rare, freakish thing: it’s a widely shared experience. But there’s so much shame and stigma surrounding it, that there’s very little room in our current cultural landscape to talk about it in an open way. What do you hope readers take away from Feast Your Eyes? The things we were talking about! I would love for this to spark more comfort talking and writing about women’s experiences. And abortion is a huge part of that. We can have a more open and honest dialogue about abortion, from the perspective of women who have them, with less fear. That would be wonderful. The other thing is friendship. One thing that I feel that books don’t spend enough time on is adult friendship. That was a big one for me: making this book about what it is like to be friends with someone over a very long period of time, and the changes that happen in friendship. And parenting: the different ways to be a parent. The balancing act between what you want for yourself and what is best for your kids, and what to do when those things don’t necessarily match. And the ability to have the clarity of vision to see when they don’t match, cause it can be very hard. I think that’s an interesting dilemma that parents face.